The usual way to demonstrate a health benefit, or disadvantage, is to start with an observational study. This entails identifying the characteristic under investigation in a large sample of the population and then observing the outcome after a good number of years. This is inevitably a long process. If we are interested in vitamin D then a blood sample will need to be taken at the beginning of the study and either tested then or frozen and stored for analysis at the end of the study. Ultimate outcome measures are obviously very important and accuracy is paramount. There must be access to the subjects and their health records, despite any movement they might make. The major illnesses that they encounter must be recorded, usually by annual contact with each subject. And then of course their deaths must be noted and the causes of those deaths must be identified. This becomes possible with good national records, better in some countries than in others. The progress of a large group of individuals has been followed up in the USA and deaths rates have ultimately been determined. Vitamin D status was identified at the onset of the study. The deaths have been grouped into Cancer Deaths, Heart Deaths, Infection Deaths, and All-cause Deaths. The inclusion of all-causes deaths is of critical importance. Something might cause an excess deaths and therefore will inevitably bring about a reduction of deaths from something else. For example war will cause trauma deaths but a reduction of heart deaths. A reduction of all-cause deaths is thus the critical starting point, and it is of course most important to us all. 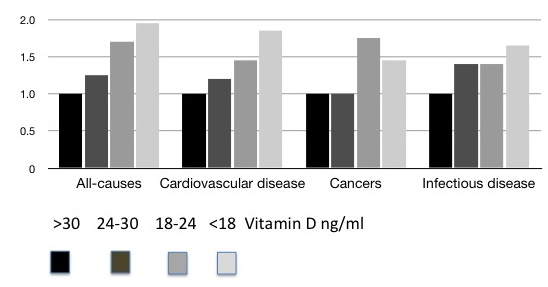 We can see the four groupings of the subjects on the basis of blood levels of vitamin D. The lowest group had levels less than 18ng/ml (less than 45nmol/L), shown in the lightest columns. This is actually the average level of about 3000 subjects who I have investigated in Blackburn, UK. The average in this study was 24 (60). The highest levels were grouped as greater than 30ng/ml (greater than 75nmol/L), shown in the darkest columns, and this brings us into the ideal range with present understanding. If we look at "All-causes" mortality, we can see that those with the highest vitamin D levels are standardised on 1, and also with the other categories of death. The other vitamin D groupings have mortality expressed as relative to this. For all-causes deaths, the relative death rate progressively increases as vitamin D levels diminish. In the group with the lowest vitamin D levels the mortality rate at 10 years was almost twice that in the group with the highest levels. We see a similar effect in deaths from cardiovascular disease, cancers, and infectious disease, but all-cause mortality shows the greatest variation indicating that vitamin D gives a wide range of health advantages, not something that is found in just a single disease or cause of death. So someone with a blood level of vitamin D greater than 30ng/ml (75nmol/L) can be reasonably assured for the future, although cannot be expect immortality! But the important thing is to identify those with the lowest levels as they are much more at risk. The study only allows us to see low levels as less than 18ng/ml (45nmol/L). Would there be any difference between people with blood level of 15 (37) and those with blood level of only 5 (12)? We do not know but the results shown indicate a gradual and progressive increase in risk with reducing vitamin D level. It is remarkable how many people have such a profoundly low blood level of vitamin D, mainly but not exclusively South Asian people living in the UK. If we wish to improve the health and life expectancy of those with the lowest blood levels of vitamin D it seems to be reasonable to give them a supplement, usually about 2,000 units per day or equivalent by mouth. Although this is now undertaken on quite a wide scale, it has not yet been demonstrated that it will be of benefit. There should ideally be a long term clinical trial, only half of those found to be deficient of vitamin D being given the supplement. This is not likely to happen as firstly it would be very expensive to conduct, and secondly would anyone give informed consent to receive a dummy tablet if known to be vitamin D deficient? We need to remember that the sun has two metabolic effects on the skin. The first and most well-known effect is the production of vitamin D. The other effect, only recently identified, is the production of nitric oxide, which seems to have at least benefits on cardiovascular health. There might be more to vitamin D deficiency that an supplement and there might be no full substitute for the sun. Melamed ML, Michos ED, Post W, Astor B.25-Hydroxyvitamin D levels and the risk of mortality in the general population.Arch Int Med 2008; 168: 1629-1637.